Clth, 6.75 x 9 in. / 160 pgs / 78 color / DVD (NTSC only). Lexicon is a facsimile cloth edition of an antiquarian Latin-Greek dictionary which the internationally celebrated South African artist William Kentridge (born 1954) has embellished with black ink drawings of what might seem at first to be animal silhouettes. In reproducing the work (which is uncollected elsewhere), this beautifully designed artist's book mischievously pits the model of the flipbook against the fragility of the antiquarian original, and flipping its pages animates Kentridge's lively, spiky drawings into a continuously morphing image that transforms from a cat to a coffee pot over the course of the book's 160 pages. This image is based on a disintegrating sculpture that reflects the artist's interest in the instability of objecthood. 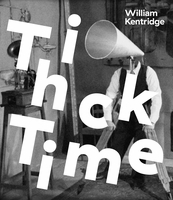 Lexiconis accompanied by a DVD containing a short film in which Kentridge flips the pages himself. FORMAT: Clth, 6.75 x 9 in. / 160 pgs / 78 color / DVD (NTSC only).